Your last romantic partner, unfortunately, turned out to be a sociopath. It was awful, but you don’t want the experience to ruin the rest of your life. You want to find a new partner — a real love, not a fake love. 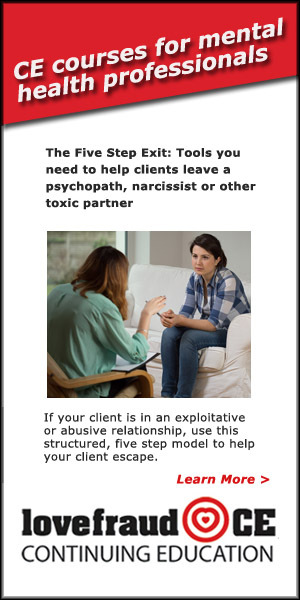 Donna Andersen knows from experience that it is possible to recover from a sociopath and move on to a healthy relationship. With this bundle, she’ll help you do it. 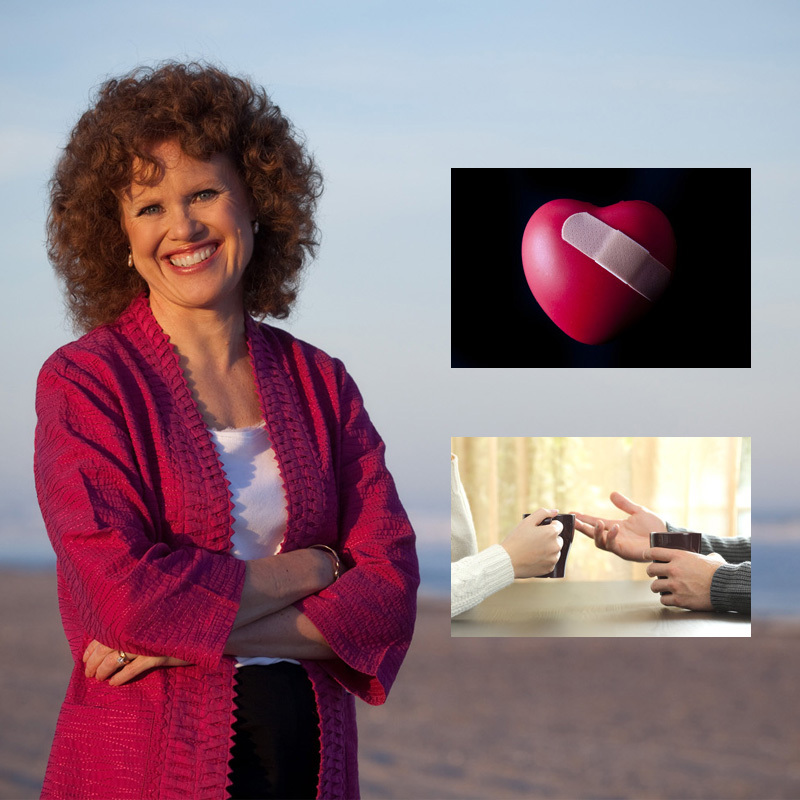 When you purchase the two relationship recovery webinars, you also have the option to add on a 1-hour personal consultation with Donna and save $25. 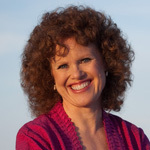 Donna Andersen is author of Lovefraud.com, a website that teaches people to recognize and recover from sociopaths. She is also author of Red Flags of Love Fraud—10 signs you’re dating a sociopath and the Red Flags of Love Fraud Workbook. Donna learned about sociopaths the hard way—by marrying one. She tells the whole outrageous story in her first book, Love Fraud—How marriage to a sociopath fulfilled my spiritual plan. 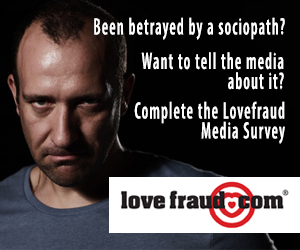 Donna has collected more than 5,000 cases of people targeted by sociopaths, and has conducted five Internet surveys of survivors. She has presented her research on sociopaths to the Society for the Scientific Study of Psychopathy. 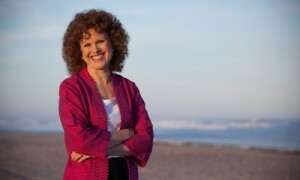 Donna is the program administrator for Lovefraud CE, which offers continuing education about personality disorders for survivors and mental health professionals. Donna has appeared on television shows including ABC News 20/20, Who the Bleep Did I Marry?, My Life is a Lifetime Movie, Handsome Devils, Urban Legends and The Ricki Lake Show. She has been interviewed for multiple radio shows, print articles and web posts. Donna is an empathetic listener, and totally knowledgeable about how sociopaths behave in relationships. She’ll offer you validation, clarity, and practical suggestions on how to move forward. If you also want to talk to Donna about your particular situation, add a personal consultation to the bundle for $70 — a savings of $25! Although this bundle does not award continuing education credits, you will be able to download a certificate of achievement upon completion of each webinar. Yes, your heart has been broken by a sociopath, but don’t let it ruin the rest of your life. You CAN recover emotionally, and you CAN date with an awareness of predators. With this dating recovery bundle, you’ll learn how.